Ingredients Pickles, Water, Vinegar, Salt, Natural Flavors, Calcium Chloride (Firming Agent), Polysorbate 80, Sodium Benzoate (Preservative), FD&C Yellow #5, And FD&C Blue #1. 4.5 average based on 2 reviews . 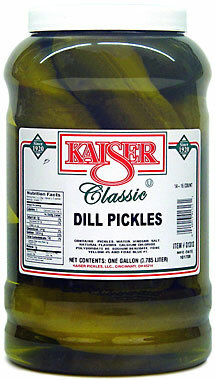 These are the best pickles in the world. I would love for you to sell the hot ones as well. Thank you for the quick the delivery. I will be ordering on the regular. I ordered the wrong product, but my family still loves these!